Sara where did you get the book? I read that they don't send copies outside the U.S. Did you go there for holidays and you ordered the book? 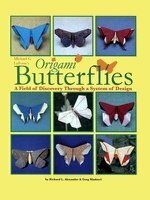 I ordered the book from Origami USA, there was no problem with getting it delivered to Germany.